The state of Civil-Military relations in Pakistan continues to be the biggest stumbling block to consolidation of democracy in Pakistan. While the relations have never followed the intent of the Constitution and therefore have never been ideal, developments in 2017 have brought further critical challenges for Pakistan’s democratic future. As an independent think tank dedicated to strengthening democracy and democratic institutions, PILDAT believes an objective analysis of the current challenges must be carried out to develop policy recommendations that can help steer the country and its democratic order at this time. Studying and analysing civil-military relations is a flagship area of PILDAT’s work. With the belief that at this time state of civil-military relations in Pakistan is the single most important factor upon which the quality of democracy in Pakistan depends, PILDAT began its work in the area in 2004. PILDAT’s work has ranged from undertaking research and study in issues relating to civil-military relations in Pakistan and cataloguing the best strategies and practices to improve civil-military relations in other countries with similar transitions to democracies after prolonged military rules. Facilitating the formation of a Dialogue Group on Civil-Military Relations, PILDAT has continued to promote and facilitate civil-military dialogue process. International Conferences and regional dialogues on the subject have also been a key plank of PILDAT’s initiative. The key outcome of PILDAT’s focus has been defining and creation of space for credible, fact-based and non-emotive discussion on the issues affecting civil military relations and to facilitate dialogue in the public domain that the civil-military equation, as experienced in Pakistan, is deterimental to Pakistan’s journey towards democratic consolidation. PILDAT has contributed a rich body of knowledge in the area spanning over 170 publications and growing, which are developed through research and study, including regional and international comparative analyses, and proposals for reforms for democratic consolidation through improving civil-military relations in Pakistan. 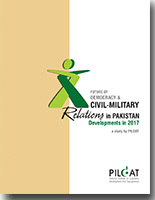 This PILDAT study attempts to provide an objective analysis of recent developments and is based on individual interactions and interviews with influential and knowledgeable cross-section of country’s civil and military elite who have first-hand knowledge of the key developments affecting Pakistan’s democratic order and civil-military relations. These persons have included senior politicians, former key ministers, opinion makers from the media, legal and constitutional experts, seasoned MPs and former military officials. The interviews for the study were conducted using the Chatham House rule and has used interactions to capture various perspectives and outlines recommendations and reform proposals.